Why Choose Michigan for Online Higher Education? The future looks bright for college graduates in Michigan. According to Michigan State University’s recruiting trends survey, employers plan to hire 63,500 new graduates in 2018. Michigan offers ample employment opportunities for new graduates, with a seasonally adjusted unemployment rate of 4.1% as of October 2018. Nationwide job growth continues to improve as well. A report by the Georgetown Center on Education and Workforce projects 55 million new and replacement jobs by 2020. The report also indicates that employers increasingly want candidates with college degrees. In Michigan, 70% of jobs will require candidates to have a postsecondary education by 2020. Continue reading to find out more about online colleges in Michigan, including important enrollment dates and how to apply for financial aid. The popularity of online programs continues to grow nationwide, including in Michigan. According to Integrated Postsecondary Education Data Systems (IPEDS), Michigan boasts 22,504 online undergraduate students and 14,686 online graduate students. Online classes appeal to full-time professionals, single parents, and students with families, who would not otherwise be able to attend school. Workers in declining industries may also turn to online classes to continue their education and facilitate a career switch. Currently, Michigan offers 124 online programs. Michigan residents attending school in-state generally pay more affordable tuition prices than their nonresident counterparts. To secure in-state tuition rates, students must provide proof of residency and physical presence for 12 months before they begin school. Nonresidents typically pay approximately 63% more in tuition, but may qualify for good-neighbor programs, which provide discounted rates. See below for the average annual tuition costs, and read on for more specific information regarding tuition and financial aid. College students in Michigan pay close to the national average for tuition: $21,380 for four-year, in-state universities, which runs slightly higher than the national average of $21,370. Students often pay less for online classes than for traditional classes, since they do not have to pay for transportation, parking, and room and board. Many colleges in Michigan charge more for online classes than for traditional classes. Below, find examples of online tuition rates for public, private, and two-year colleges in Michigan. Before out-of-state residents decide to attend school in Michigan, they should consider several factors that impact their finances. First, attending college as a nonresident almost always costs more than attending an in-state school. Michigan employment rates and educational outcomes may outweigh the higher cost of tuition, and colleges occasionally extend in-state tuition fees to out-of-state residents enrolled in online classes. Out-of-state students can also count on the reciprocity agreement or good neighbor discounts in Michigan. Twelve neighboring states make up the Midwestern Higher Education Compact. These states include Illinois, Indiana, Iowa, Kansas, Minnesota, Missouri, Nebraska, North Dakota, Ohio, South Dakota, Wisconsin, and Michigan. The compact’s Midwest Student Exchange Program upholds that these partner states cannot charge nonresidents more than 150% of the in-state tuition. Many state and public institutions charge out-of-state tuition even for online degrees; however, students can find tuition breaks, as well. The Midwestern Higher Education Compact (MHEC) includes 12 neighboring states that are committed to improving education accessibility: Illinois, Indiana, Iowa, Kansas, Minnesota, Missouri, Nebraska, North Dakota, Ohio, South Dakota, Wisconsin and Michigan. In this group’s Midwest Student Exchange Program, public universities cannot charge more than 150% of in-state tuition for non-residents. As more colleges have begun offering online programs across state borders, the National Council for State Authorization Reciprocity Agreements (SARA) has developed to regulate distance learning and provide quality standards to protect online students. States and colleges join SARA on a voluntary basis. Some states, such as California, opt out of joining. SARA has helped make distance learning more affordable for students pursuing an education across state borders. As online programs proliferate, the task of finding the best affordable college in Michigan becomes more daunting every year. 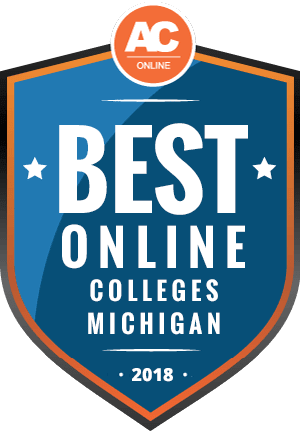 To help students sort through the top affordable online colleges in Michigan, we have compiled a list of accredited institutions, which offer the most online programs at the lowest in-state tuition. The institutions listed below also have high graduation rates, favorable student-to-teacher ratios, and ample scholarship and grant opportunities. Read on to learn more about the top online colleges in Michigan. Founded in 1919, Siena Heights University (SHU) is one of 18 Dominican Catholic universities in the U.S. In addition to the main campus in Adrian, Michigan, SHU has seven other campuses and also offers fully online degree programs. SHU’s online bachelor’s degrees are geared towards adult learners needing maximum flexibility, and are offered in areas such as accounting, business administration, management, marketing, professional communication and nursing. Also available online are associate degrees, graduate degrees and a variety of minors. Online students can stay well-connected with the school via online support resources such as academic advising, individualized degree planning, library databases and assistance, tech support, online student accounts, social media and Spectra, the online campus and student newspaper. Students can also easily apply for and manage their financial aid online. SHU accepts transfer credits, and students may be eligible to receive credit for military service and other learning experiences such as employment, specialized training and volunteer work. Davenport University (DU), one of Michigan’s oldest and largest private, non-profit universities, has several campuses and learning centers across the state, along with its ever-expanding Global Campus. The Global Campus offers online degrees through DU’s Colleges of Business, Technology and Health Professions, with several career-focused four-year degrees in areas such as sports management, technology project management, cyber defense, nursing and accounting. Online courses here are presented through Blackboard and offered in either asynchronous or synchronous formats. Synchronous courses rely on Real Time Virtual learning (RTV) technology, which is great for online students wanting to participate in classes and lectures remotely. At DU, both new and continuing students who are attending a fully online program but live outside of Michigan state may qualify for a tuition discount. Additional tuition reduction may be available for military students and those attending DU through a partnership college articulation agreement, including several in Canada. It makes sense that with a large presence in Michigan state, Central Michigan University (CMU) also makes its mark as a large, global online university. This translates to a diverse selection of online educational opportunities, ranging from undergraduate certificates to doctoral degrees. CMU’s online bachelor’s degrees are offered in areas such as education, psychology, political science and fashion design, along with accelerated BS-MSA degrees in integrated leadership studies, administration and community development. These accelerated programs can help students save money in the long run, as some of the credits earned in the bachelor’s programs will go towards the MSA degrees. They can also save time, since students begin work on master’s courses while finishing their bachelor’s degrees. For increased convenience and flexibility, CMU’s online courses are offered in 8, 12 or 16-week blocks, in either synchronous or asynchronous format. Online students have access to several student support resources, despite being remote. Michigan Technological University (MTU) is a public research institution located in Houghton, Michigan, with innovative degree programs focusing on science, math, technology and engineering. However, despite its name, the university also offers a range of programs in non-technical fields such as such as history, liberal arts, psychology, pharmaceutical chemistry, bioinformatics, forestry, and theater and entertainment technology. While MTU doesn’t currently offer fully online undergraduate degrees, it does make individual online courses available. At the graduate level, students can pursue an online undergraduate post-degree certificate, one of six master’s degree programs or a PhD in Mechanical Engineering-Engineering Mechanics. Students who are accepted to MTU are automatically considered for several in-house merit-based scholarships. Those who are on-campus can apply for campus student jobs to help cover the cost of tuition. Paid undergraduate research, paid internship and full-time employment opportunities are often found through MTU career fairs, which are held each spring and fall. Eastern Michigan University (EMU) in Ypsilanti, just outside of Ann Arbor, is considered a major research and teaching institution. Founded in 1849, with roots in the education profession, EMU is one of the largest producers of education professionals in the U.S. Altough education is big at EMU, the college does offer several other undergraduate and graduate programs. Four-year degrees range from education to urban planning, with fully online programs available in dietetics, nursing and technology management. In addition to a range of program options, in-house scholarships are also plentiful at EMU, with almost 100 just through the College of Education alone. Students may also be able to save on tuition through transfer credits and Michigan community college articulation agreements. The University of Michigan-Ann Arbor (U-M), founded in 1817, is the oldest public university in the state, and still consistently receives high-rankings, while also employing award-winning faculty. With almost 300 areas of study, there is no shortage of degree options here. Currently the university houses 19 colleges, several of which offer fully online undergraduate and graduate degree programs, in areas such as dental hygiene, automotive engineering, manufacturing, nursing and health management. Online courses and programs are also available through U-M’s Flint and Dearborn campuses. As far as affordability goes, students should check out U-M’s financial aid department for a list of in-house, state and private scholarships. Michigan residents may be eligible to get their tuition fully covered through the Michigan Indian Tuition Waiver or the GO Blue Guarantee programs, plus campus-based students with young kids can apply for a U-M child care subsidy to help pay for child care while on-campus. Marygrove College in Detroit, is a Catholic, liberal arts graduate college that offers master’s degrees in teaching, with specialization in areas such as special education, mathematics, reading and literacy, and education leadership, plus master’s degrees in human resource management and social justice. Graduate certificates are also offered in human resource management, Autism spectrum disorder and school administration. Admission is selective, with basic requirements of at least a 3.0 GPA, along with an undergraduate degree from an accredited college or university, with possible additional criteria set by the individual program. Students can enroll either part-time or full-time, and many programs can be completed fully online and in two years or less. Depending on the program, courses will be either 7 or 15 weeks long. The MAT (Master in the Art of Teaching) degree is popular here, and is a 7-week, 2-course per semester program with a required Capstone project. Marygrove also offers an interest-free tuition payment plan. Cornerstone University (CU), located in Grand Rapids, began as a seminary school, and has evolved into an independent evangelical college offering degrees at both the undergraduate and graduate level. Online programs here range from associate to doctoral level, with the majority being bachelor’s and master’s degree programs geared towards working adults. In addition to Christ-centered programs such as ministry leadership and biblical studies, CU Online offers several degrees in business, education, psychology and human services. Connected to the college is the Grand Rapids Theological Seminary, for students looking for more in-depth theology-related graduate degree options. Online students of CU can take advantage of several student resources, including online library services, on-demand tutoring, and audio recordings of chapel services, and can sign up for free Microsoft software. CU also gives students opportunities to incorporate work and travel into their curriculum through ministry internships, fellowships, study tours, urban cohorts and off-campus semester study programs. Students looking for a solid business-related degree program should check out Northwood University, a small, private, non-profit business school with a strong management focus. The main campus is in Midland, but there are other locations across Michigan and in Texas and California, along with several fully online and hybrid degree programs. A lot of the programs here are designed for adult working professionals, but students can also choose degree programs geared towards academics. Online students can go with more traditional majors, such as accounting, finance and marketing, or zero in on a more specific area such as sports management, automotive marketing and management or franchising management. The franchising management degree is unique to Northwood-it is the only fully accredited bachelor’s degree of its kind in the U.S. For students just starting out, Northwood offers the Educational Success Program, which is a 12-day residential program that helps high school graduates transition smoothly to college life. Madonna University is a small, Catholic college with its main campus in Livonia, along with several others, including two international campuses. Degrees here are career-focused, with associate, bachelor’s, master’s and one doctoral degree available. What’s unique about Madonna is its program choices, which tend to zero in on specific interests and career paths. Madonna was the first in the country to offer bachelor’s degree in sign language studies and hospice education. Many programs are offered completely online and include areas of study such as family and consumer science, online teaching and eLearning, senior living administration and humane studies. Other more traditional majors offered online include criminal justice, accounting, hospitality and tourism management and an accelerated BSN program. Transfer students will be pleased to know that Madonna has articulation agreements with several community colleges. A large percentage of Madonna students receive financial aid, and luckily Madonna offers over 900 scholarships, plus students can apply for both state and federal aid programs. Since 1873 Spring Arbor University, a devoutly Christian institution, has provided diverse higher education opportunities to Michigan residents. Today, SAU has more than 70 different degree programs to choose from, with 11 learning facilities located across the state, plus one center located in Ohio. The university’s virtual campus, Spring Arbor University Online offers 10 online bachelor’s and master’s degree programs, giving students even more ways to complete their degree. Currently, undergraduates have three online bachelor degree programs available to them in nursing, social work and business. The bachelor of social work program is 100 percent online and has been recognized as a top 25 program among Christian universities. Classes through SAU Online are conducted in seven-week intervals, which allows students to take courses one at a time, right from home. Like traditional programs at SAU, all online programs incorporate religious-driven components to help develop students’ spiritual and mental health. Ferris State University has fully online and blended programs available in both graduate and undergraduate certificates as well as bachelor and master degrees. Through FSU Online, students can earn their bachelor degree from home in unique sectors such as technical education teaching, automotive management, dental hygiene, respiratory therapy, business and nursing. All of the online bachelor programs offered at FSU are designed as degree-completion programs. To enroll in one of the 11 available online bachelor programs, students must hold an associate degree or have accumulated between 40 and 48 college credits, depending on the program selected. To make the credit-transfer process simpler, FSU is part of two Michigan-based agreements that allow students to transfer up to 30 general education credits between schools. FSU also provides detailed information in an online guide to the transfer process for each community college within the state. Out-of-state students need not worry; FSU also has transfer agreements with at least one school and one degree program in every state, the highest concentration being in Illinois with 17 schools. Cleary University has roughly 135 years’ experience in the business of business. The eastern Michigan university has over 40 associate, bachelor, master and certificate programs available, all rooted in business practices. For online students, there are many opportunities to complete a bachelor of business administration degree either fully online as a degree-completion program or through a blended format. More than 15 business tracks are offered to students in specializations such as entrepreneurship, health care management, accounting and finance, executive management and international business management. Cleary University uses the learning management system Moodle to deliver web courses, and the amount of time required to complete a bachelor program heavily depends upon the degree track and student’s previous education. To honor professionals in public service, Cleary University began the courage and public service tuition program to help police, EMTs, park rangers, public school workers, firefighters and many more, affordably complete their bachelor degree. Qualifying individuals can take 100 percent online courses and can receive 90 transfer credits. After 150 years of service in downtown Detroit, Wayne State University asserts that it is Michigan’s most diverse higher education institution. With more than 350 different academic programs available and students hailing from 70 countries around the world, Wayne State lives up to its claim. Extending from a vibrant campus life, Wayne State’s online programs have grown to include 100 percent online certificate, bachelor’s and master’s degree programs. The university also has a select number of partially online certificates and one doctoral program. To enroll in the online Bachelor of Social Work program, students must have, or be in the process of earning, 60 college credits, and have a minimum 2.5 GPA. To graduate from the program, students must complete a total of 120 credits, including nine electives and 51 core credit hours taken at Wayne State. The largest independent university in Michigan, the Baker College of Flint has 11 campuses sprinkled around the state and an acclaimed virtual school, Baker Online. In 2016, the Online Learning Consortium (OLC) bestowed Baker Online with an “exemplary" status on its quality scorecard, the OLC’s parameter for judging colleges. Through Baker Online students have numerous program options offered at every level of post-secondary education. More than 25 bachelor degree programs can be completed fully online, a few of which, such as the information systems, psychology and general studies degrees, are only offered through e-learning. Other online bachelor degrees offered at Baker College include programs in computer science, teaching, business, healthcare and criminal justice. Just as in an on-campus classroom, virtual classes are structured with due dates and deadlines, and students can collaborate and converse with professors and fellow pupils all online. Baker College’s digital library never closes its doors, so online students always have access to research resources. With an annual student enrollment surpassing 50,000, Michigan State University is the largest academic institution operating in Michigan. Students take classes on-campus in East Lansing, at distance learning centers around the state, abroad and online. MSU offers over 200 degree programs and more than 100 online courses each semester. At the bachelor, master and doctorate level, MSU has over 40 online and hybrid degree programs available. Undergraduates can earn an online degree in either nursing or early care and education. The bachelor of arts in early care and education is a hybrid program, with a minimum 50 percent of coursework being completed online. The bachelor of science in nursing program (RN to BSN) is presented as a part-time, online program to be completed over five semesters. It was designed with working registered nurses in mind, giving them a leg up in their careers with a higher accolade. To help pay for college, MSU has financial aid resources available and scholarship opportunities. In 2018, MSU gave out nearly $500,000,000 in financial aid to students. The global campus at Northern Michigan University is making it easier than ever to earn a degree online and at one tuition price, regardless of where you call home. All students taking online classes at NMU pay in-state tuition rates, and those living in areas of northern Wisconsin and Michigan can qualify for free LTE internet service, provided by NMU. The global campus at NMU has 18 online degree programs, seven of which are offered at the undergraduate level. Online bachelor degrees are available in psychology, nursing, criminal justice, loss prevention management, clinical lab sciences and workplace leadership. To enter the nursing or clinical lab sciences program, students must have previous education, such as an associate degree and certifications in each field. Online courses are conducted through EduCat, NMU’s digital classroom system, created through Moodle. With EduCat, students participate in live discussions, turn in homework and have access to class documents, simulating a real-life classroom experience. At the University of Michigan-Dearborn, the student body is Michigan-proud with 96 percent native to the state. Through online education however, students can now enroll in UMD programs without leaving their home state thanks to interstate online education agreements. UMD’s online learning department has 18 master’s degree programs, created for students with busy lifestyles. Students can earn their degree entirely online in business, computer science, engineering, management or education. Online courses are delivered through Canvas, a digital space that functions as a classroom. Students can download an app to their smart device and have access to their courses at anytime. In addition to the 18 fully online degrees, UMD has many other graduate programs that can be completed mostly online or in a hybrid capacity. For undergraduate students, UMD has hundreds of individual online courses available each semester that students across degree levels can enroll in. In addition to its traditional on-campus undergraduate programs, Grace Bible College has several online bachelor degree options designed as adult education programs. Grace Bible College incorporates Christian religious practices and beliefs into the mold of every program and offers degrees in faith practices. Through GBC Online, students can complete a bachelor of science in business, leadership and ministry, human services and psychology. Within each degree path, students can opt for a concentration in either marketing, women’s ministry, adult aging, criminal justice, youth ministry or in any of the four majors. To complete these programs, students need 120 total credits, with 60 bachelor credits. GBC estimates students spend two to four years earning their bachelor degree, depending on the student’s previous education experience and earned credits. Specializing in nursing, education, health sciences and engineering, Oakland University has 15 fully online degree programs available to students. Two bachelor degree programs are currently offered, one in environmental health and safety (EHS) and one in nursing. The bachelor of science in nursing degree is a BSN-completion program for registered nurses who have an associate degree. Students can take online classes in 14-week intervals or at an accelerated rate, completing classes in intense, seven-week sessions. The bachelor of science in EHS is also totally online and should require four years of academic study to complete. All of OU’s online courses are administered through the digital education system Moodle and the university provides online technical support for the system. Some courses may require students participation in real-time activities. The online undergraduate degree programs at OU are provided at in-state tuition costs for all students. Western Michigan University has nine campuses extending throughout Michigan, two locations in Florida and an online education department, offering 16 virtual degree programs. Six online undergraduate degrees are offered in areas such as nursing, comparative religion, health services and family studies. The B.S. in family studies or in child and family development programs can be completed fully online or, if a student desires, classes can be taken at the Kalamazoo campus. After completing either of these degrees, students are granted the position of Certified Family Life Educator. WMU gives online students a variety of services and resources to address any issues or confusion with distance learning. Step-by-step instructions for accessing online classes and operating WMU eLearning, the digital platform used for courses, can be found on the school’s website. At the University of Michigan-Flint, undergraduate students can earn a bachelor of business administration degree fully online with three degree specializations. Currently the BBA programs are the only online undergraduate degrees provided by UM-Flint, but individual online classes can be completed to supplement face-to-face courses. The online BBA degree can be earned in accounting, marketing and general business. To apply to this program, students must be accepted to UM-Flint or transfer with 25 minimum earned credits and have already completed pre-business courses. Classes are operated through Blackboard, a virtual learning system, and assignments are completed on the student’s time. The online BBA program adheres to the school’s normal semester patterns and does not offer any classes at accelerated speeds. Offered through UM-Flint’s School of Management, online students can partake in student activities such as studying abroad, internship programs and a business pitch competition. Walsh College has provided business education to students in the Detroit area since the early 1920s. Throughout the years, Walsh has grown in size and in program diversity. Today the college has two campuses, multiple learning centers and a digital learning platform, offering certificates and bachelor and master’s degree programs in business fields such as marketing, management and accountancy. Undergraduate students at Walsh can earn a bachelor of business administration degree online, with four majors to choose from: marketing, general business, management or finance. Students can also pick a minor to add-on to their program in finance, information technology, accounting, marketing or management. A typical baccalaureate program requires four years to complete, but students transferring to Walsh with prior credits can graduate faster. Walsh allows students to transfer a maximum of 82 credits from community colleges and 91 from a university. Students navigating online college websites for information may find the task tedious. To simplify the process, we compiled frequently asked questions below. If you have questions about online degrees in Michigan, continue reading to find answers. Do online credits cost more or less in Michigan? Colleges have the autonomy to set tuition charges for online programs with approval from the Board of Trustees. Students may pay nominally more for online degrees in Michigan, but for the most part, tuition remains consistent between distance learning and in-class programs. Ferris State University, for example, charges undergraduates $421 per credit for in-class instruction, and $433 per credit for online classes. In some cases, online tuition may cost less for nonresidents. Davenport University charges its online students $741 per credit, more than traditional students, but nonresidents pay $495 for distance learning courses. Conversely, online students pay the same tuition as traditional learners at Central Michigan University. Online students may not always pay less — or even the same — for tuition in Michigan, but they save by not having to pay for transportation, parking, and room and board. Which Michigan schools accept the most transfer credits? If you have college credits from a two-year or four-year college, you may expedite your degree by choosing a college that accepts more transfer credits. Every college has its own rules regarding transfer credits. Hope College accepts up to 65 community college credits and 96 overall credits, whereas Michigan State University accepts 60 transfer credits toward a bachelor’s degree. Generally, students have the most success transferring credits when they have a high GPA, and are transferring between a two-year and four-year college. Colleges, such as the University of Michigan, mandate that students have earned a “C” grade or higher to transfer credits. Public institutions also tend to have more generous transfer policies than private colleges. Many students transfer during college. More than one-third of undergraduate students transfer at least once, according to a study by the National Center for Education Statistics. Students can search the Michigan Transfer Network to see if their credits would transfer to another Michigan college or university. As a MHEC member, Michigan offers a streamlined transfer process for nonresidents. Michigan transfer agreements also help community college students receive credit for their core classes when transferring to four-year colleges. Will any online colleges in Michigan accept a GED? Admission requirements for online students differ between Michigan colleges; however, much like traditional undergraduate admission requirements, most online programs accept students with GED certificates, though applicants with diplomas often have an advantage. Applicants typically must submit their GED certificate, GED score, and transcripts showing all high school grades prior to receiving a GED. When students transfer from a community college, their GPA matters more than their high school diploma or GED certificate. Most colleges accept students with a GED. Central Michigan University accepts undergraduate students to its global campus and online programs with either a GED or high school diploma, and the University of Michigan also accepts students with a GED, though its admissions office may require these students to take additional SAT testing. Do any online colleges in Michigan start every week, or month? Online classes at Michigan colleges typically run concurrently with traditional on-campus classes, following a term or a semester schedule. Michigan online colleges — such as Central Michigan University, which runs on eight-week terms — often have distance learning courses with spring, summer, and fall start dates. Other institutions, such as Oakland University, offer winter start dates for both traditional and online courses. Online classes sometimes have different start and end dates than traditional on-campus classes. Classes may follow, eight, 12, 15, or 16-week term formats. Each program observes its own rules regarding start and end dates. For example, the online bachelor of science nursing program at Eastern Michigan University offers students six start dates throughout the year: two in the fall, two in the spring, and two in the summer. Check your college’s website to obtain a copy of your program’s academic calendar. Which online colleges will accept FAFSA in Michigan? All regionally accredited online colleges and universities in Michigan accept the FAFSA. Undergraduate and graduate students must complete a new FAFSA every year to receive federal grants and loans. Your aid amount depends on your financial need, and how much money you have borrowed in the past. To receive aid, students must be United States citizens or eligible noncitizens with Social Security numbers. To receive certain aid, such as from the Direct Loan Program, students must maintain at least part-time status in college. Students become eligible for federal financial aid when they attend a regionally accredited public and private college in Michigan. That includes two-year and four-year accredited universities and colleges. Meet with a financial aid adviser at your college to find out about your options and how to maintain eligibility for federal financial aid throughout your college career. Are there any free online classes I can take from Michigan colleges? Students taking online classes anywhere in the country can expect to pay money for them, though some exceptions to that rule exist. Students may find opportunities to take free not-for-credit college classes online. Universities and colleges in Michigan often partner with online learning platforms Coursera and edX to provide students with online classes on a variety of different subjects, from healthcare to web design. The University of Michigan regularly partners with Coursera to offer not-for-credit online classes in subjects such as teaching and assessing clinical skills or web design for everybody. The length of online classes range from 4-7 weeks. Similarly, Michigan State University also offers a free introduction to game development. Courses do not offer college credit, but they may provide certification. Middle school and high school students and teachers can also find free online classes on Michigan Virtual. Online classes teach students in arts, culture and diversity, math, and reading and writing. How can I find the online program options at Michigan’s colleges? The Michigan Virtual Campus, while not an actual school, connects distance education data and information across the state. Its Distance Education Catalog helps potential online students find detailed online learning information by type, courses or programs, subject, school, and term. Many colleges in Michigan administer their online programs separately. For example, Cal State Online manages both fully and partially online bachelor’s, master’s, and doctorate degrees across 23 campuses and 460,000 students. The UC system has online programs for both matriculating and nonmatriculating students, and large-scale universities, such as the University of Southern Michigan and Stanford University, have hundreds of programs administered through their proprietary systems online.